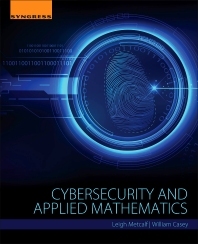 Cybersecurity and Applied Mathematics explores the mathematical concepts necessary for effective cybersecurity research and practice, taking an applied approach for practitioners and students entering the field. This book covers methods of statistical exploratory data analysis and visualization as a type of model for driving decisions, also discussing key topics, such as graph theory, topological complexes, and persistent homology. Defending the Internet is a complex effort, but applying the right techniques from mathematics can make this task more manageable. This book is essential reading for creating useful and replicable methods for analyzing data. Leigh Metcalf research’s network security, game theory, formal languages, and dynamical systems. She is Editor in Chief of the Journal on Digital Threats and has a PhD in Mathematics. Will Casey works in threat analysis, code analysis, natural language processing, genomics, bioinformatics, and applied mathematics. He has a MS and MA in Mathematics and a PhD in Applied Mathematics.